I tried a melatonin in the middle of the night and slept in till 7:01 this morning! (=12:01). Rage and Wolf! Nighty night, Anne. I have melatonin ''in case of emergency'', too, Wolf. It works well for me. Yippee! Hope you have sunshine, too! Do they taste like normal strawberries? Thankful I have never had problems sleeping. Everybody!! What? Wolf lost first! I'm flabbergasted that Wolf was able to take care of essentials and post 5 minutes after awakening! Unusual strawberries! Mine are a different shape, and grow on plants close to the ground. Morning all, I'm watching the golf in Judy territory, Torrey Pines, San Diego. 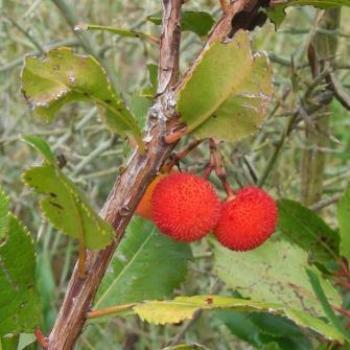 Jacalmi, these strawberry trees are a native of Western Europe and Mediterranean countries. I dedicate that last post to Keith!!! And thank you, Shiela!! Here's flying your way! Late start on computer due to computer problem but I got the security issue taken care! Even later start for me - howdy to all! Don't forget - Wombat posted a poozle - it's a fun one too! Thx for remembering, shosho. I've been busy and haven't had much time for Sudoku lately. I've done everything required to get ready for starting radiation. It is scheduled to start on the llth. 1:45. Good morning everyone. I've just cooled down after my long Sunday morning run - I set out to do 28km but got a little carried away and ended up with a little over 31km! Didja get lost on the way back, Chris? I'll have a Cascade please barman. The drinks are on me folks so step up and name your poison!